In 1997, husband and wife team Billy and Aileen Campbell opened the doors to their new dental surgery in the picturesque village of Camlough, Newry. 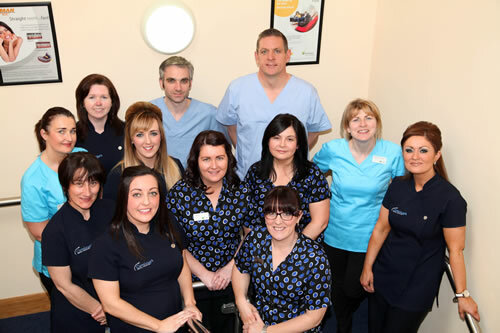 Our primary aim was to create a welcoming environment with highly trained staff and the latest in dental technology. Since then, our practice has grown to include four dentists, a practice manager, five nurses and two receptionists while hundreds of people from across Ireland have become valued patients who enjoy treatments of every kind. Our services include a full range of the latest dental techniques including routine check-ups, implants, bridges and teeth whitening. We’re dedicated to helping you achieve the best in oral health and a smile you can truly be proud of. That’s why we have won ‘What Clinic’s’ Customer Service award in 2015, the silver certificate for the BDA Good Practice Scheme, as well as being shortlisted to win the BDA Practice of the Year award 2012.